With the life cycle of the Playstation 3 winding down after almost 10 years on the market, lets go back and check out some titles you may not have played when they were released. The beauty about discovering these classics is that you'll no doubt nab them at a pretty cheap price at your local CeX store. So, sit back and enjoy as I take you through the best platformers on the Playstation 3. Three of these games are technically re-releases from a previous generation. However, while some of you out there might think that's bit of a cop out, they were all out on the Playstation 3. So yeah, come at me. First on our list is Lego Star Wars: The Complete Saga. Though there were plenty of Lego games prior to this, this is the game that kicked off the continued franchise/milking of all things Lego. From Lego games of Indiana Jones, Harry Potter, The Lord of the Rings and Jurassic Park, you name it and there's a Lego version if it. It's a bit like Rule 34, really. Lego Star Wars: The Complete Saga plays like every other Lego game, but with Star Wars characters, locations and music. You play through Episode 1-6, take control of basically every Star Wars character ever, get to swing around a lightsaber and even build your own Frankenstein-like Lego character. It's not a serious Star Wars game if you're looking for a perfect adaptation of the films, but it's a really fun game that can easily be enjoyed by all. Oh and you can totally wipe out a bunch of Ewoks. Enjoy. Originally released on the Dreamcast back in 2000, I bloody loved Jet Set Radio when it was first out. I worried that it might not work on the Playstation 3, what with it being over a decade old at this point. However, Blit Software's port released in 2013 was absolutely perfect. Taking a different approach than most re-releases, it added nothing new to the game, instead simply giving us the high-definition take on the much loved Dreamcast game. 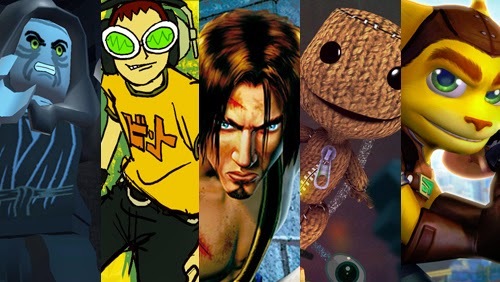 Unlike Sega's re-release of Sonic Adventure, Jet Set Radio has aged like a fine wine, and offers players slick roller-skating gameplay, an awesome cel-shaded city to zip around and one of the best, most badass soundtracks to have ever graced a game. The games focus is all about laying down tags across the city using your spray cans, all the while going up against various other street gangs. It doesn't really belong in a specific genre, but platforming is the one that sticks the most. Back in the day I loved the original Prince of Persia. Though I never played it on the Apple II on release, I played the Sega MegaDrive port in 1993. It was- and still is- one of the undisputed kings of the platformer genre. Though the series eventually evaporated, it came back with a bang with 2003's Prince of Persia: The Sands of Time. It was an incredible game that relied on the same formula of the original, but also threw up a time reversing mechanic to great effect. This was later followed by two games, Warrior Within and Two Thrones, and all three of these games has been remastered in high-definition in Prince of Persia Trilogy. It's an essential purchase for anyone who enjoys a good adventure game, and one of the most recent examples of a truly perfect platforming formula. Also worth nothing is that in 2010 Ubisoft added to the franchise with The Forgotten Sands, a game that took place between The Sands of Time and Warriors Within. Granted it's not on this remastered re-release, but it's a must if you enjoy this classic trilogy. What can I say about LittleBigPlanet 2 that already hasn't been said? It's just such a perfect game, and one that bettered the original game in every way imaginable. Essentially, LittleBigPlanet 2 is all about creating levels and games, and sharing those creations with its large and ever growing community. You can just about create anything you want really, ranging from simple platforming games, obstacle courses, full fledged games that can even vary in genre and style and, most surprisingly, creatures and robots that you can rig up to move. Of course, there is a single-player campaign available, and though it is fun, it pales in comparison to the fun you'll have with the level creator. The sky is the limit with LittleBigPlanet 2, and it doesn't just make for one of the best Playstation 3 platformers out there, but also one of the best plaformers ever- period. Again, essential gaming for any gamer out there looking for one of the best experiences on the Playstation 3.